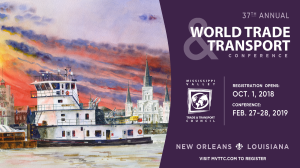 The Mississippi Valley Trade & Transport Council once again host the 37th Annual World Trade & Transport Conference on February 27-28 2019. The conference will be held at the Omni Royal Orleans in the New Orleans French Quarter. Panelists discussed various topics including river statistics, port updates and commodities. VISIT US AT BOOTH 1-28! Intermodal South America will showcase products like presence of logistics solutions and services, transport services and products, trade services and products and allied products and services. It is an international exhibition for logistics, transport, cargo and international trade. The visitors give a patient wait for this event and they get benefited to a greater extent. It also succeeds in getting international brands. The event is well known for portraying the best strategies to grow and develop brands etc. in the Automotive, Bicycles, Rickshaw & Spares, Plant, Machinery & Equipment, Railway, Shipping & Aviation Products, Travel & Tourism industries. VISIT US AT BOOTH #1214! The ISRI Convention & Exposition is back in Los Angeles April 8-11, 2019. Nowhere else in the world can you access more than 5,000 recycling professionals from across the U.S. and across the globe; an exhibit hall spanning more than eight acres and featuring state-of-the-art equipment and technology, and educational programming focusing on critical industry issues and information – all in one place, all for the taking. VISIT US AT BOOTH #550! 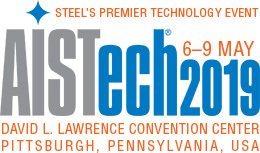 AISTech 2019 — Steel’s Premier Technology Event will be held at the David L. Lawrence Convention Center, Pittsburgh, Pa., USA. This event will feature technologies from all over the world that help steel producers to compete more effectively in today’s global market. AISTech is a can’t-miss event for anyone involved at any level of today’s steel marketplace, providing perspective on the technology and engineering expertise necessary to power a sustainable steel industry. Whether you present, attend or exhibit, take advantage of this opportunity to network with industry peers and discover ways to improve your productivity. VISIT US AT BOOTH #440! IMX is the annual trade show for the inland and intracoastal marine transportation industry. At the show, you will find equipment and services that are critical in the transportation of goods along U.S. inland and intracoastal waterways. VISIT US AT BOOTH #ECI-WW! The world’s leading experts will meet at METEC the international trade fair for metallurgy, steel casting and steel production. 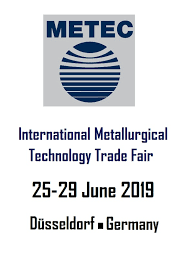 Machinery, plants and products for the steel industry, environmental and resource preservation or energy efficiency - If you want to be actively involved in shaping the industry markets of tomorrow, then METEC 2019 is a must.